The bathroom. It’s not a place to experiment with inferior building materials. Choose wisely and you’ll enjoy the fruits of your labor for many years to come. Go with a substandard material and you’ll be paying the price. 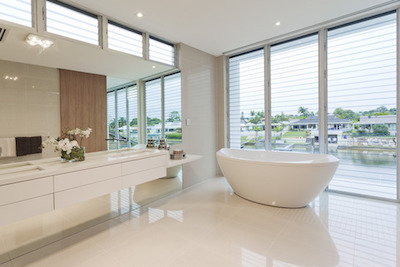 Bathrooms need water resistant materials. And tiles are one of the best ways to achieve it. Just remember that selecting tile for your bathroom is a big deal. Before you install tile, whether on the floor, the shower walls, or the backsplash around your vanity, it’s important to make a choice that will not only look great, but will wear well no matter what you do. The bathroom floors will have to withstand all kinds of moisture. From floods and tidal waves when the kids bathe, to daily steam from the shower, your flooring can take a lot of abuse. Porcelain and ceramic tiles have long since been favorites of homeowners throughout Colorado. Both come in a wide array of colors, patterns and styles. And with today’s modern twist, you can incorporate the look of cement or even wood into a tile that will provide wear-resistance while keeping up with the latest trends. Think shower tile. Think inspiring. Choosing tile that handles well in a shower doesn’t have to mean you settle for boring. There are many different tiles that can inspire the senses while giving functionality throughout the day. The color and pattern can be anything you choose. Make the right selection and you’ll avoid chips and scratches that can come from everyday activities. Not only does a fully tiled wall give you added moisture resistance, it can make a stunning statement as well. Consider using neutral colors, natural stone is a great choice. Granite or marble can also be applied for a unique application. You can also use tiles to spruce up any location. A backsplash made of glass tiles can add to your décor while preventing damage to the surrounding area. Choose metallic tiles to add a touch of class. Change up the size to create an even different look; tiles come in all shapes and sizes, and with a little planning, can add beauty just about anywhere. Ready to add bathroom tile to your remodel? Start the process be seeing what’s available now. Stop by today.